This illustration demonstrates the obstetrical manoeuvre of ‘internal version’. The baby is presently in an undeliverable position with a transvers lie and the head extended. The health professional (doctor or midwife) first pulls down the legs to be delivered first. This is called a ‘breech delivery’. The extended head following may or may not be a problem. If it is, the health professional may attempt to put a finger in the child’s mouth to bring the chin down and flex the head, known as ‘Smellie’s manoeuvre’. If this does not work, forceps are applied to assist delivery. 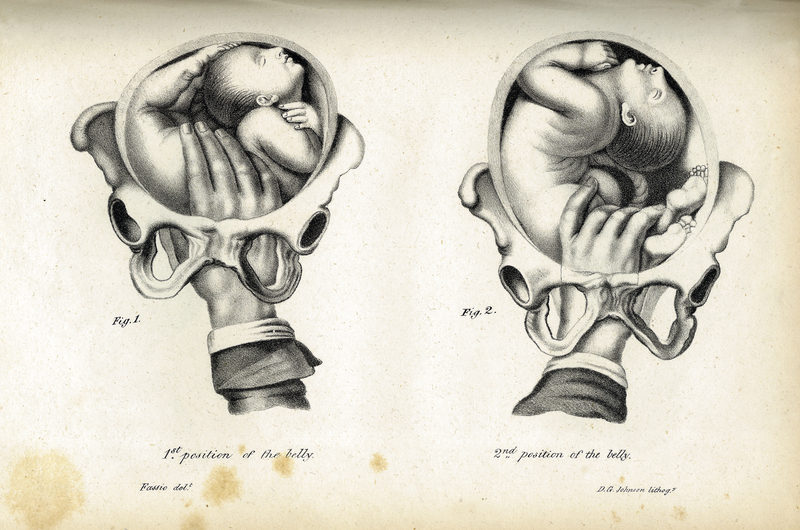 J. P. Maygrier, “Midwifery Illustrated,” ourheritage.ac.nz | OUR Heritage, accessed April 22, 2019, http://otago.ourheritage.ac.nz/items/show/11082.